What singularity of human nature and genetics creates the fearless individual? What allows for the kind of disinhibition that creates a chance taker. Might we venture to say that this personality type is the result of missing factors? If there are chromosomes that account for things like conscience, the reality principal and ethics (concerns usually associated in Freudian terminology with the superego), are these mutated in the great adventurers, gamblers and intrepid criminal minds? In 1969, John Fairfax the English daredevil rowed across the Atlantic and three years later he rowed across the Pacific with his girlfriend Sylvia Cook. 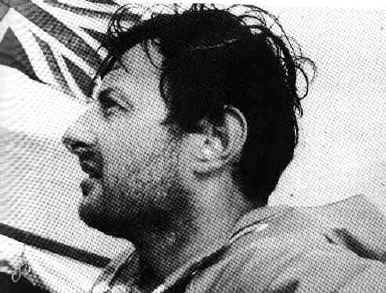 Margalit Fox’s Times obit, “John Fairfax, Who Rowed Across Oceans, Dies at 74,” (NYT, 1/18/12) recounts how Fairfax’s only practice for the Atlantic run was rowing “daily on the Serpentine, the lake in Hyde Park. Barely more than half a mile long, it was about eight-thousandth the width of the Atlantic, but it would do.” But his derring-do began early. “On a camping trip when he was 9, John concluded a fight with another boy by filching the scoutmaster’s pistol…At 13, in thrall to Tarzan, he ran away from home to live in the jungle…at 20, despondent over a failed love affair, (he) resolved to kill himself by letting a jaguar attack him…(and) In Panama, he met a pirate, applied for a job as a pirate’s apprentice and was taken on.” It’s the same profile that enabled Philippe Petit to walk a tightrope between the twin towers, that allowed Houdini to practice his death defying stunts, Lindbergh to fly the Atlantic and John Glenn to become the first astronaut to orbit the earth. It also bears similarities to the profile that created Jesse James, Pretty Boy Floyd and Clyde Barrow. Speaking of the criminal mind, Fairfax also, according to Gawker, liked hookers ("John Fairfax Loved Hookers: Ten 'Juicy'Stories Omitted From His NYT Obit"). Call it an absence or the presence of what psychiatry terms narcissistic megalomania, in the case of Fairfax heredity and environment conspired to produce a hero.